CG PET Application Form 2019: CG Pre Engineering Test is a test which is organized by the Chhattisgarh Professional Examination Board (CPEB). It is a state level entrance exam to get the admission in engineering, agriculture engineering, and dairy technology courses. In most of the cases, the CG PET Form 2019 will be available in the month of March. Through this exam, the applicant can get the admission in various private/government colleges/institution. So in this article, we are providing all the detail regarding the CG PET Eligibility Criteria. Those applicants who will apply for the CG PET is required to know that the CG PET online application form will be available from the March last week 2019(expected). The expected CG PET Last Date is 3rd week of April 2019. The other detail regarding the date is given below in the table. Those applicants who will apply for the CG PET have to fulfill the eligibility criteria. The CG PET 2019 Eligibility criterion is given below. If any of the candidate not eligible for the CG PET they can’t apply for the CG PET 2019. Applicants who are applying must have the resident of Chhattisgarh state. Those candidates who are in final year program can also apply for this. The applicant who will apply for the agriculture engineering, have the minimum age limit of 16 years as from the 31st December at the time of the admission and for that of dairy technology, it is of 17 years. Applicants who want to apply for the Engineering should pass the 12th from the Chhattisgarh board with subject PCM and one technical vocational subject with minimum 45% marks(for general category) and 40% marks for the ST/SC/OBC. Those applicants who are applying for the Dairy Technology must pass 12th or equivalent board form PCM and English with at least 50% marks in PCM and English for general category and that for the reserve category it is 40%. A candidate who will apply for the CG PET is required to fill the CG PET Online Application Form 2019. The application form will be available on the official website of the CG PET. 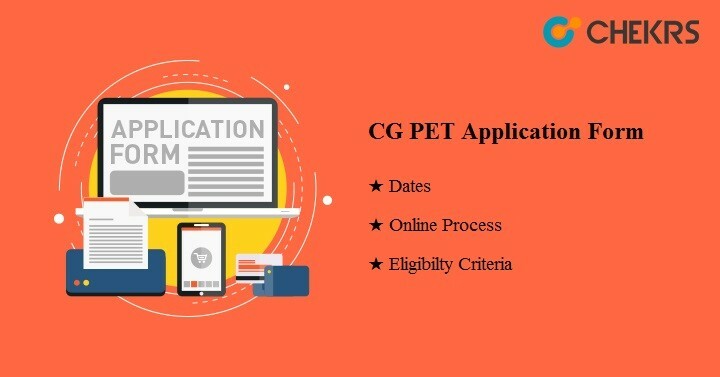 Those applicants who don’t know the process of filling the application form is required not to worry we are providing here the detail steps for filling the application form of CG PET 2019. Then applicant requires to click on ‘CG PET Online Application Form’ Applicants require to enter the details like their citizenship, name of the candidate, father name, name of the exam for which they were applying for, mothers name, fathers name, DOB etc. After entering all the detail applicant require to download the image with the prescribed size and formats with their impression of the thumb. Click on the “Browse” button and select the file to upload the image. Then applicant required to fill all the details which are asked in the application form. After filling all the detail applicant require to click on the “I Agree” Then they require to click on Submit button and read all the detail which is filled by the candidate before click on the “Please Confirm” button. After doing all the process applicants reach to the final stage of the application form i.e. application fees. Click on the “Pay” tab and applicant require to select on the mode of payment for submitting their fees. Enter all the detail and do the transaction successfully after doing the transaction successfully applicant require to check their transaction status. At last, applicant required to take print out of the application form for the future use. An applicant who will appear in the CG PET Exam 2019 is required to submit the fees. The fee is divided according to the category of the candidate. The CG PET 2019 Application Form Fees are given below in the table. Applicants have to pay the fees as per their category. The fee can be paid through online mode or through the challan to any branch of the SBI. The information provided here is as per the official notification. If the applicant has any queries regarding the CG PET 2019 details they can contact us through the comment box.